Got an old Tattoo that needs covering and looking for a Cover Up Tattoo Artist Hertfordshire? Well look no further than our experienced Tattoo Artist Iain! This customer, Richard, came in with an old tattoo done a good few years before. It was right in the middle of his outer forearm and he came in to the I Aint No Saint Studio to talk with Iain about what could cover it. As with all Cover Up Tattoos, the existing Tattoo will determine what can be used to cover it. So although this customer had a rough idea of what he wanted, it was up to Iain to create something that would work. 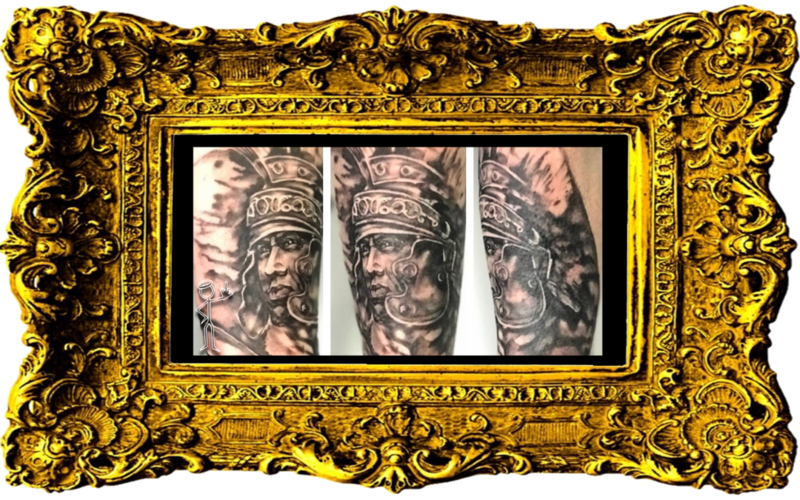 On the day of the appointment, Iain showed Richard what he had come up with – a powerful Roman Centurion portrait. Richard was very happy with the image and they sat down & got to work. With over 14 years experience as a Tattoo Artist Iain has done a fair few cover ups during that time. He can tell what will and won’t work as a cover up, so please always keep an open mind when enquiring about getting a Cover Up Tattoo. It is always best to come in to the Studio to have a chat about your cover up, that way Iain can take a look at what you have got in the skin and discuss what the options for a cover would be. A cover up can develop more on the day of your appointment; for example Iain might create something even more suited to ensure the best cover possible between the time of booking and your appointment. 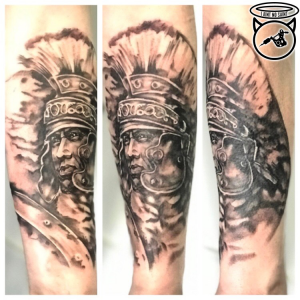 Here at I Aint No Saint our Cover Up Tattoo Artist Hertfordshire Iain wants to make sure you have a Tattoo that will stand the test of time and will give you the confidence a well done tattoo gives you. Many customers who come to the I Aint No Saint Studio haven’t been able to bear their skin in public because they dislike an old Tattoo that much – if that’s you, make sure you come in to the Studio to talk about your Cover up Tattoo! If you’d like to see more of Iain’s cover up’s make sure you check out his gallery here. Richard booked in for a half day session and had the piece completed – start to finish – in that one appointment. So, come in to the Studio during our opening times (do call ahead to make sure that Iain will be available!) or get in contact with us now to start the ball rolling to get booked in with our Cover Up Tattoo Artist Hertfordshire; Iain Nosaint!